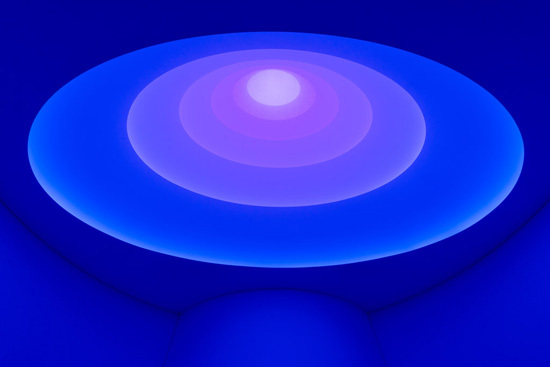 Criticized by me on CultureGrrl and on WNYC public radio for over-hyping its rotunda installation as “one of [James] Turrell’s luminous and immersive Skyspaces,” the Guggenheim Museum, I’ve just learned, has posted a video about how “Aten Reign” differs from (and, I believe, falls short of) true Skyspaces. A link to that video was tweeted yesterday by @MOMAPS1, whose Meeting, 1986, is an early, authentic Skyspace. People always think the sky is blue and that we just received this blue. The fact is, it’s possible in some of the Skyspace pieces to make the sky any color you like….We’re part of creating the reality in which we live. This seems to me a distinction without a difference, but reasonable people can disagree (and one has now done so). And in other Skyspace news: A spokesperson for the Nasher Sculpture Center, Dallas, confirmed to me (as previously reported by Samuel Rowlett on the Hyperallergic blog) that Turrell has offered to redesign the Skyspace that was renounced by the artist and shuttered by the museum because the view of the sky had been irredeemably compromised by a flashy new apartment tower that was erected nearby. Making the best of this mess, the Nasher is currently organizing a city-wide exhibition—Nasher XChange—with 10 public sculpture commissions created in celebration of the beleaguered, resilient museum’s 10th anniversary.